Last month I had the opportunity to travel to Essen, Germany to attend UbuCon EU 2016. Europe has had UbuCons before, but the goal of this one was to make it a truly international event, bringing in speakers like me from all corners of the Ubuntu community to share our experiences with the European Ubuntu community. Getting to catch up with a bunch of my Ubuntu colleagues who I knew would be there and visiting Germany as the holiday season began were also quite compelling reasons for me to attend. The event formally kicked off Saturday morning with a welcome and introduction by Sujeevan Vijayakumaran, he reported that 170 people registered for the event and shared other statistics about the number of countries attendees were from. He also introduced a member of the UbPorts team, Marius Gripsgård, who announced the USB docking station for Ubuntu Touch devices they were developing, more information in this article on their website: The StationDock. 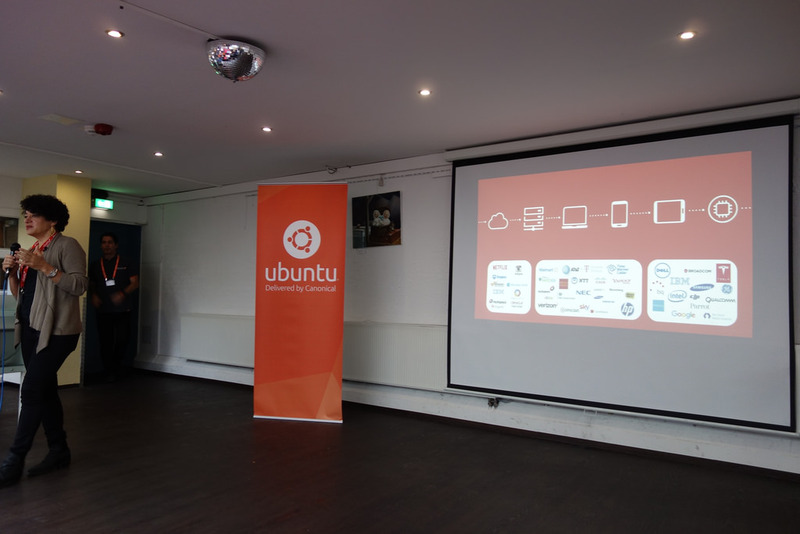 Following these introductions and announcements, we were joined by Canonical CEO Jane Silber who provided a tour of the Ubuntu ecosystem today. She highlighted the variety of industries where Ubuntu was key, progress with Ubuntu on desktops/laptops, tablets, phones and venturing into the smart Internet of Things (IoT) space. 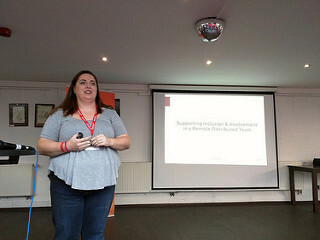 Her focus was around the amount of innovation we’re seeing in the Ubuntu community and from Canonical, and talked about specifics regarding security, updates, the success in the cloud and where Ubuntu Core fits into the future of computing. I also loved that she talked about the Ubuntu community. 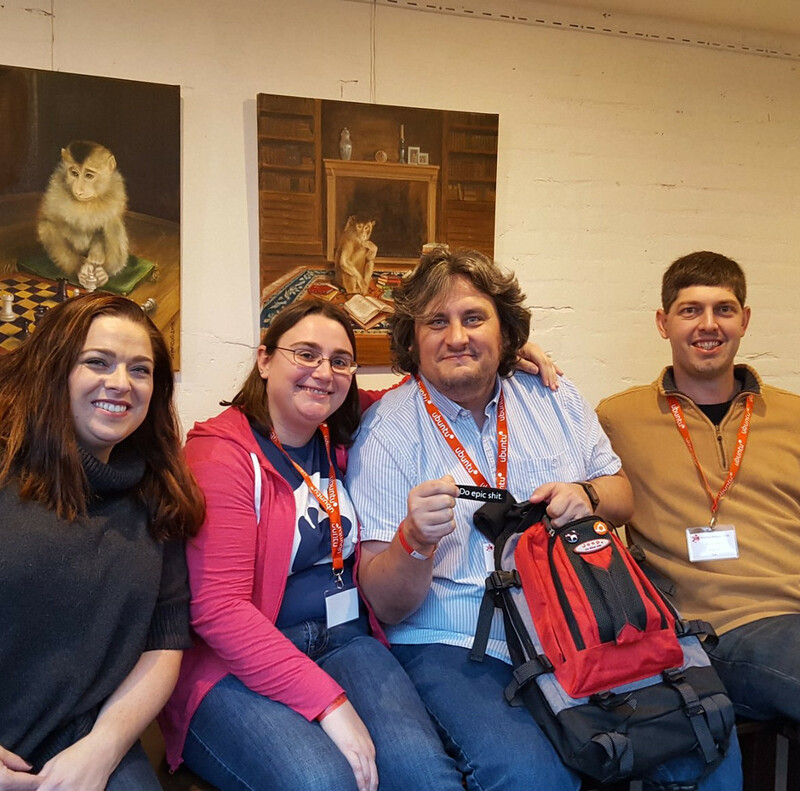 The strength of local meetups and events, the free support community that spans a variety of resources, ongoing work by the various Ubuntu flavors. She also spoke to the passion of Ubuntu contributors, citing comics and artwork that community members have made, including the stunning series of release animal artwork by Sylvia Ritter from right there in Germany, visit them here: Ubuntu Animals. I was also super thrilled that she mentioned the Ubuntu Weekly Newsletter as a valuable resource for keeping up with the community, a very small group of folks works very hard on it and that kind of validation is key to sustaining motivation. The next talk I attended was by Fernando Lanero Barbero on Linux is education, Linux is science. 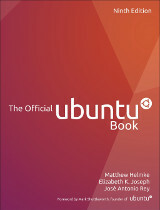 Ubuntu to free educational environments. Fernando works at a school district in Spain where he has deployed Ubuntu across hundreds of computers, reaching over 1200 students in the three years he’s been doing the work. The talk outlined the strengths of the approach, explaining that there was cost savings for his school and also how Ubuntu and open source software is more in line with the school values. One of the key takeaways from his experience was one that I know a lot about from our own Linux in schools experiences here in the US at Partimus: focus on the people, not the technologies. We’re technologists who love Linux and want to promote it, but without engagement, understanding and buy-in from teachers, deployments won’t be successful. A lot of time needs to be spent making assessments of their needs, doing roll-outs slowly and methodically so that the change doesn’t happen to abruptly and leave them in a lurch. He also stressed the importance of consistency with the deployments. Don’t get super creative across machines, use the same flavor for everything, even the same icon set. Not everyone is as comfortable with variation as we are, and you want to make the transition as easy as possible across all the systems. 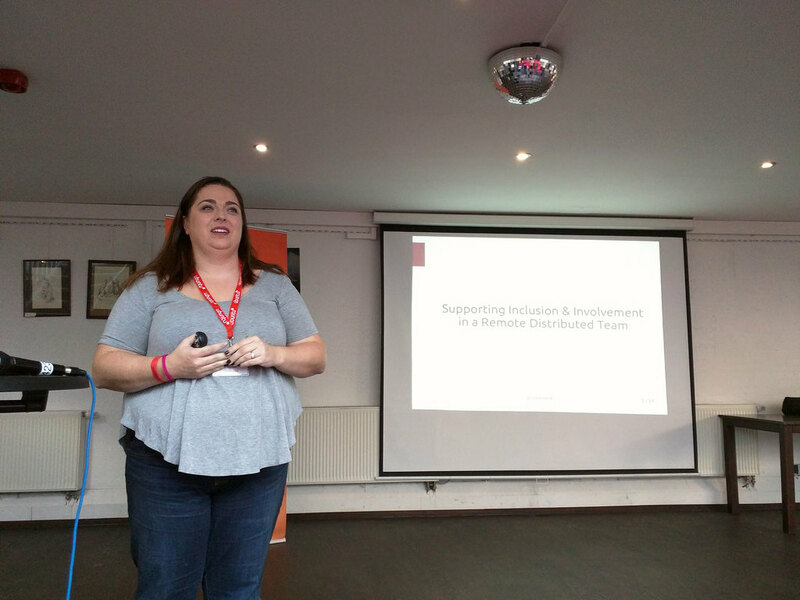 Laura Fautley (Czajkowski) spoke at the next talk I went to, on Supporting Inclusion & Involvement in a Remote Distributed Team. The Ubuntu community itself is distributed across the globe, so drawing experience from her work there and later at several jobs where she’s had to help manage communities, she had a great list of recommendations as you build out such a team. She talked about being sensitive to time zones, acknowledgement that decisions are sometimes made in social situations rather than that you need to somehow document and share these decisions with the broader community. She was also eager to highlight how you need to acknowledge and promote the achievements in your team, both within the team and to the broader organization and project to make sure everyone feels valued and so that everyone knows the great work you’re doing. Finally, it was interesting to hear some thoughts about remote member on-boarding, stressing the need to have a process so that new contributors and team mates can quickly get up to speed and feel included from the beginning. 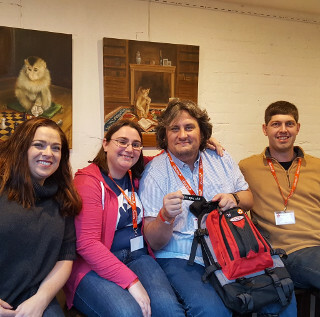 I went to a few other talks throughout the two day event, but one of the big reasons for me attending was to meet up with some of my long-time friends in the Ubuntu community and finally meet some other folks face to face. 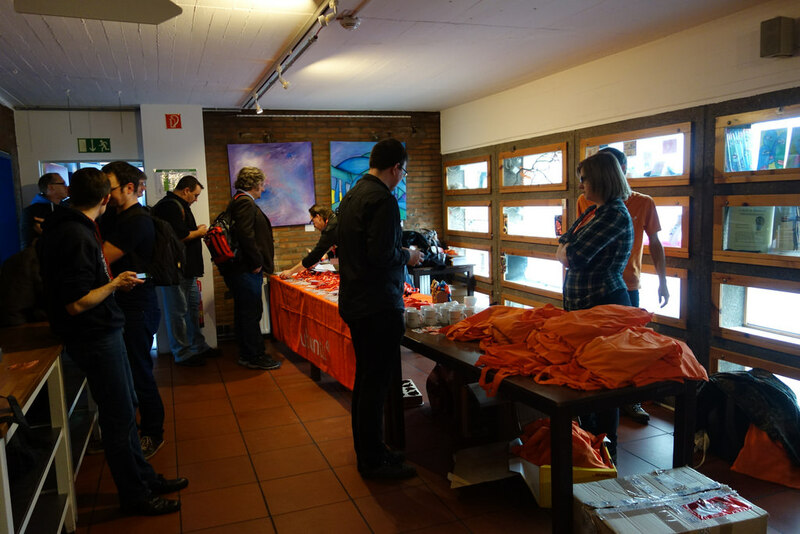 We’ve had a number of new contributors join us since we stopped doing Ubuntu Developer Summits and today UbuCons are the only Ubuntu-specific events where we have an opportunity to meet up. 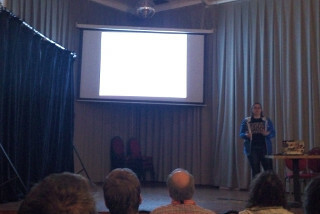 Of course I was also there to give a pair of talks. I first spoke on Contributing to Ubuntu on Desktops (slides) which is a complete refresh of a talk I gave a couple of times back in 2014. The point of that talk was to pull people back from the hype-driven focus on phones and clouds for a bit and highlight some of the older projects that still need contributions. I also spoke on Building a career with Ubuntu and FOSS (slides) which was definitely the more popular talk. I’ve given a similar talk for a couple UbuCons in the past, but this one had the benefit of being given while I’m between jobs. This most recent job search as I sought out a new role working directly with open source again gave a new dimension to the talk, and also made for an amusing intro, “I don’t have a job at this very moment …but without a doubt I will soon!” And in fact, I do have something lined up now. The venue for the conference was a kind of artists space, which made it a bit quirky, but I think worked out well. We had a couple social gatherings there at the venue, and buffet lunches were included in our tickets, which meant we didn’t need to go far or wait on food elsewhere. I didn’t have a whole lot of time for sight-seeing this trip because I had a lot going on stateside (like having just bought a house!) 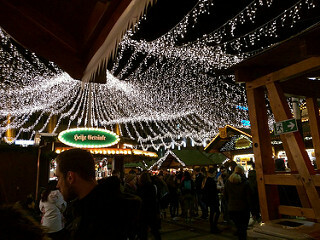 but I did get to enjoy the beautiful Christmas Market in Essen a few of nights while I was there. 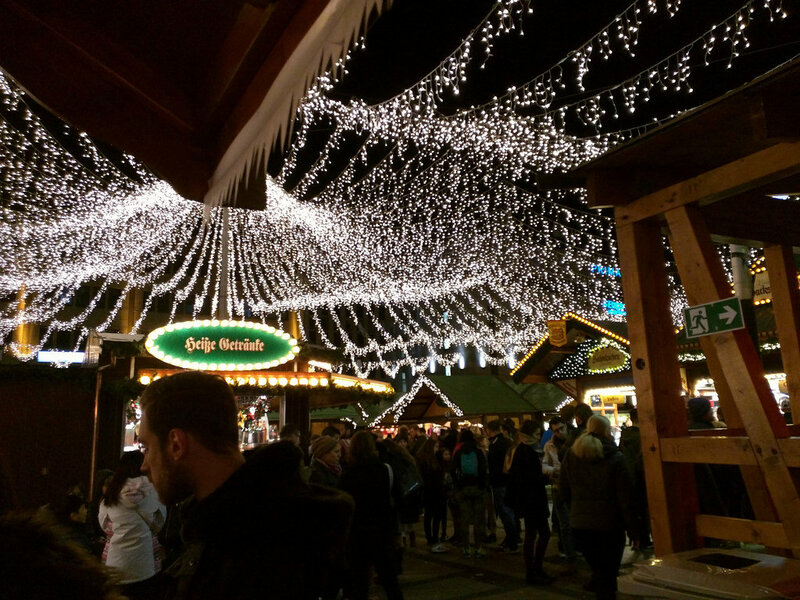 For those of you not familiar with German Christmas Markets (I wasn’t), they close roads downtown and pop up streets of wooden shacks that sell everything from Christmas ornaments and cookies to hot drinks, beers and various hot foods. 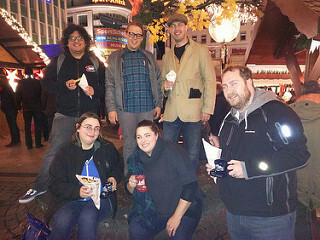 We went the first night I was in town we met up with several fellow conference-goers and got some fries with mayonnaise, grilled mushrooms with Bearnaise sauce, my first taste of German Glühwein (mulled wine) and hot chocolate. The next night we went was a quick walk through the market that landed us at a steakhouse where we had a late dinner and a couple beers. 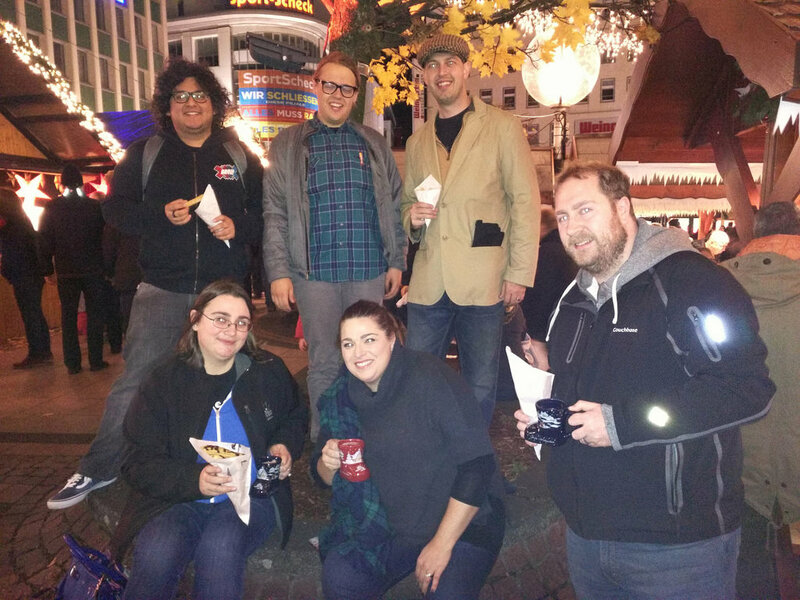 The final night we didn’t stay out late, but did get some much anticipated Spanish churros, which inexplicably had sugar rather than the cinnamon I’m used to, as well as a couple more servings of Glühwein, this time in commemorative Christmas mugs shaped like boots! The next morning I was up bright and early to catch a 6:45AM train that started me on my three train journey back to Amsterdam to fly back to Philadelphia. It was a great little conference and a lot of fun. Huge thanks to Sujeevan for being so incredibly welcoming to all of us, and thanks to all the volunteers who worked for months to make the event happen. Also thanks to Ubuntu community members who donate to the community fund since I would have otherwise had to self-fund to attend. This entry was posted on Sunday, December 11th, 2016 at 4:03 pm and is filed under events, LoCo, tech, travel, ubuntu planet. You can follow any responses to this entry through the RSS 2.0 feed. Both comments and pings are currently closed. It appears that there is much nepotism in the way certain people are constantly using all the Ubuntu donations to travel. This is the first time I’ve used the fund myself (my previous employer paid my way and sponsored events, but I was not employed while speaking at this event), but I never witnessed nepotism in the process when I was on the Community Council (CC). Reports by the community team are released about applicants and specifically what the money is used for, and I haven’t heard any complaints from people saying they’ve been refused funding. If you have specific knowledge of requests being denied to community members it’s definitely something to bring up with the CC. Entries (RSS) and Comments (RSS). 26 queries. 0.086 seconds.